Now that the 2014 HBCU football season is in the books, voters from across the country will put pen to ballot and decide the inaugural Black National Champion. The distinction, which crowns the best historically black college football team from either the FCS or Division II ranks, is mythical, because the title isn’t decided on the field as it should be. HBCU Sports, taking a page from the College Football Playoff final four, has decided to create a similar paring to crown a national champion. 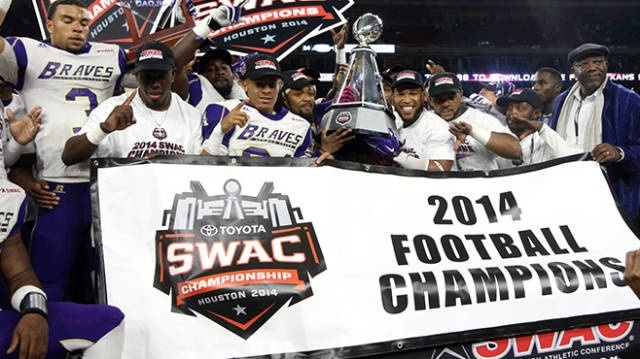 The Braves capped off an impressive 9-3 2014 regular season with a 38-24 win over Southern to capture their first SWAC Championship Game victory. The rare five-way tie-breaker allowed Morgan State to win the MEAC for the first time in 35 years. The Bears made the FCS playoffs before losing in the opening round to Richmond. Even though the Bulldogs didn’t grab a postseason berth because of the way the conference tie-breaker concluded, Buddy Pough’s team bounced back from a slow start to rattle off wins against nationally ranked Bethune-Cookman and then MEAC leader North Carolina A&T. After starting the season 0-2, Virginia State won 10 straight games, including the CIAA Championship Game over a Winston-Salem State team that hadn’t lost a conference game in more than 1,500 days. VSU capped off their run with a 28-17 win over LIU in the Division II playoffs. HAIL TO THE MIGHTY VIRGINIA STATE TROJANS!!! !